Turning fairy tales into living history type travel just became possible. This is not time travel but enchantment for families to access. Surround a trip to Fairy Tale Nights in eastern Tennessee at Rock City Gardens by reading again the familiar stories and discovering new ones from other cultures. I’ll share some details about my library and bookstore adventures in a moment while you consider whether you want to wear a costume to Fairy Tale Nights, where you’ll enter the 15 acres of intriguing rock formations in the gardens on Lookout Mountain, towering above Chattanooga. 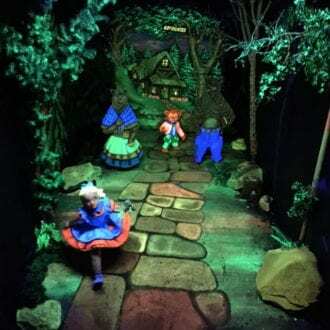 This is a year-round place, but to welcome spring evenings 20 sets of fairy tale characters roam the gardens for the city’s Spring Break Safari. Dates in 2015 are March 27 through April 19 from 6:00 – 9:00 p.m.
Meet up with Cinderella and her fairy godmother, Sleeping Beauty and her fairy guardian, Little Red Riding Hood and Three Little Pigs and the others you know so well. High tea can be arranged with Alice in Wonderland and the Mad Hatter or knight training and sword fighting with Queen Guinevere’s cohorts. Rock City Gardens is way more than the iconic See Rock City signs on rooftops and bird feeders; the path is three-quarters of a mile, winding among at least 400 native plants and interesting, sometimes complicated rock formations. Gnomes appear on rock tops and a fairyland of displays reminiscent of store windows on Fifth Avenue at Christmas fills an easy-to-enter cave. This is a family place: started by Frieda Carter in 1930, the daughter of German immigrants, promoted by her husband Garnet Carter, and guided today by third-generation family member Bill Chapin, chair and CEO. So what should a family read on the road trip to Chattanooga to expand fairy tale character encounters? A stunning pop-up favorite for grandchildren in my house is How to Find Flower Fairies, a British book by Cicely Mary Barker. This book sharpens alertness to discoveries under petals and leaves. For the classics, consider a scholarly tome and then some artistic masterpieces of paintings and pencil drawings. 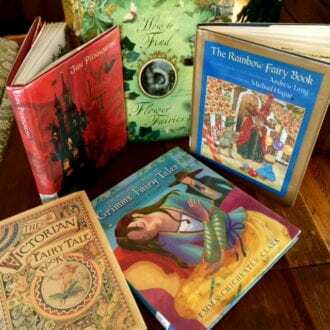 The Victorian Fairy Tale Book outlines the renaissance of fairy literature in 16th and 17th century England and the courts of Louis XIV after the Crusaders, Puritans and zealots had chased the stories away. Charles Dickens said had he married Little Red Riding Hood, he would have found perfect bliss. 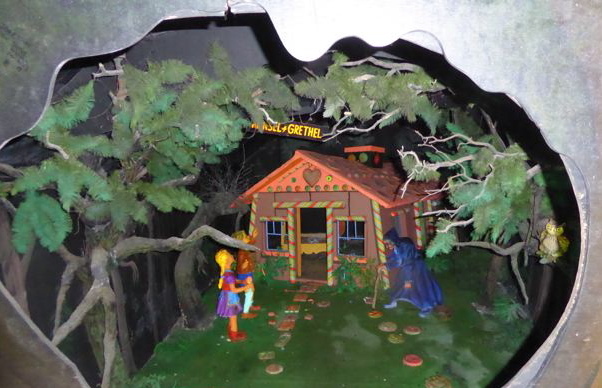 The Grimm brothers – Jacob and Wilhelm – visited in simple village homes in the German countryside to collect more than 200 local stories. Tales from Mother Goose started as a small volume compiled by Charles Perrault for the Court of Versailles. A fairy tale is the imagination looking backward and science fiction is the imagination looking forward. Twelve volumes of the Colored Fairy Tale books (red, green, lilac, crimson, etc.) seem like a big investment but they’re wonderfully multicultural with classics you know plus fairy tales of Native Americans and from Rhodesia, Lapland, India, Spain, China and Japan. I checked out the Rainbow title from my library and delighted in 70 illustrations by Michael Hague, including full color plates and pencil drawings. How Much Is Only Make Believe? You who read the tales know very well how much is true and how much is only make-believe. Gotta love the name of the book’s publisher too—Books of Wonder: William Morrow and Company in New York. You might introduce the kids to Grimm’s in a different voice in the McElderry Book of Grimm’s Fairy Tales because Saviour Pirotta retells these stories in contemporary language and the illustrations by Emma Chichester Clark are full of mischief, spookiness and loveliness.